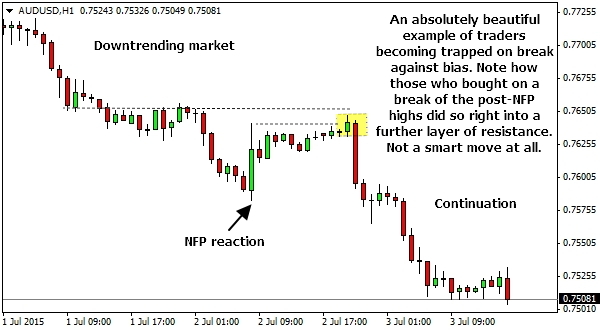 Within hours of publishing last week's article, I received contact from two readers who both had identified similar opportunity within other forex pairs. I'm not 100% sure of the timeframe that AC was looking at. I assume it was the 1H; the same as in the article. And upon opening the AUD/USD 1H chart it just stands out beautifully. I read your email this morning and a few hours later I noticed cable had climbed back up to resistance (prior day high) and quickly retraced, into this weeks down trend. a little confusion: This post is from July 2015, and the post you refer to as “Last week’s” is from August 2014. The first article, “Feeling Joy when I look at this PA”, was originally posted on the 8th August 2014. It was sent out via the newsletter on this date as well. Then on the 3rd of July 2015 it was resent via the newsletter. It’s not often that I “recycle” an old article. Just maybe once or twice a year when life gets in the way and doesn’t provide me with time to write something new. But this was one of those times. 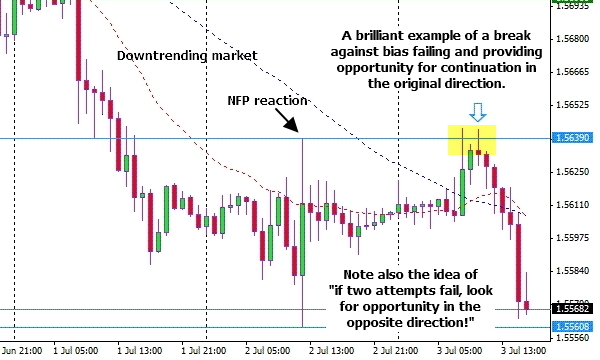 The second article, “Watch breaks against bias”, dated 10th July, was in response to feedback from the 3rd July reposting. Thank you for the reply Lance.